Last week, we revealed the winners of The Escapist Awards of 2013, awarding what we felt were the best games of their respective genres in the calendar year. There were some doozies: The Bridge won Best Platformer while we turned heads naming Pokemon X & Y Best RPG of 2013. The Escapist editors then had the arduous task of narrowing down the five best games of the year, and then choosing the one to honor with our highest award of 2013. The decision was tough, but in the end there could be only one Game of the Year. Still, we chose a runner-up that will not surprise anyone. Greg Tito, Editor in Chief of The Escapist: I am a pirate, and I love it. Sailing the open seas, capturing pitiless cogs and magnificent brigs alike in Black Flag is a glorious experience. It feels as authentic to the Golden Age of Piracy as possible while delivering the fantastically refined stealth-action mechanics Ubisoft has perfected over the years. In other words, it's freaking fun and came a spore's width away from winning The Escapist Award for Game of the Year 2014. Here's the thing, after all the Johnny Depp movies and the pirates vs. ninja memes, I didn't even know that I wanted a pirate-themed game in 2013. I certainly enjoyed the naval side-missions in Assassin's Creed III, and probably wasted too much time investing money in upgrading my ship instead of the Homestead. 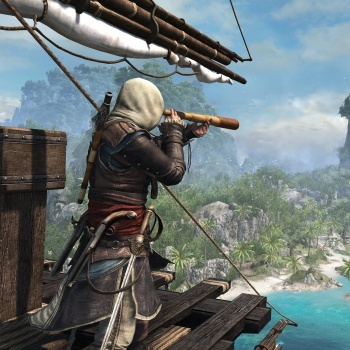 And when I heard AC4 was going to be based on the open seas, I thought that sounded like a great idea. Was it ever! Every isolated cove, palm tree-encrusted beach, and rogue wave in the Caribbean is yours to explore. Assassin's Creed IV is so full of entertaining collectibles and interesting challenges like defeating island fortresses and elite ship captains that it sometimes feels like you have to pull yourself away to advance the story. But once you do, the narrative of Edward Kenway slowly learning about the ancient conflict between Assassins and Templars is a refreshing romp compared to the series' other protagonists. Kenway is a pirate first, and he respects the freedom that life affords him more than the peasant life awaiting him back home in Wales. The artifact the forces are chasing - the Observatory which allows you to view anyone anywhere - even has thematic implications in our own era. A pirate game that makes me consider the NSA and Edward Snowden? Well played, Ubisoft. Black Flag worked great on next generation systems as well as the current consoles. In fact, Ubisoft released it on nearly major every platform available (including PC!) nearly simultaneously and each version worked swimmingly with virtually no bugs. Sure some glitches exist, but overall the number of reports have been low. It's sad such a feat is so remarkable, but I don't know of another title which has straddled so many different consoles (and generations) with so few complaints from the user base on bugginess, lost framerates, or lag. If only the technical wizards at Abstergo Entertainment, er Ubisoft, would release a save game converter those for us who wanted to upgrade to the Xbox One/PS4 version, we'd all be a lot happier.